Pineapple Muffin from Humboldt Seed Co. It's a cloudless late September day on the Humboldt Seed Co. near Orleans, which sits tucked above the Klamath River in the eastern-most stretches of Humboldt County. As a small group walks up a hill, past a vegetable garden and a small creek, the farm's main cannabis cultivation site comes into view, with large plants in full bloom, their colas stretching toward the sky and their pungent scent filling the air. But this isn't the typical grow scene. Instead of hundreds and hundreds of identical plants — grown from clones or seedlings designed to produce indistinguishable cannabis flowers of the same strain — virtually no two plants at the site are the same. Instead, the garden is a showcase of cannabis diversity. Tall spindly plants intermix with short squat ones. The plants' foliage varies from deep purples and seaweed greens to almost mossy, florescent chartreuse. The buds range in size from footballs to golf balls and their scents cross the spectrum from vibrant fruits and florals to biting odors of cheese and gasoline. Even the plants' origins are wildly diverse. Some were grown from seeds long tucked away in sock drawers and hidden compartments, or brought back from Jamaica, while others are crosses or modifications of popular strains. It's a giant, raw, cannabis buffet. The garden, Humboldt Seed Co. owner and founder Nat Pennington explains, is one of the centerpieces in a massive, collaborative effort dubbed the "phenotype mega hunt," in which Pennington and his cohorts are studying 10,000 different cannabis plants with the aim of finding a few "unicorns." Indeed, the vast majority of these plants — 99.5 percent — will be crossed off the list and discarded, as the goal of the hunt is to comb through all this genetic variation to find the truly unique, whether it be a flavor profile, unusually high THC and CBD content, robust yields or, ideally, some combination thereof. These 50 or so plants will then be used to clone, breed and — ultimately — create seed stock. 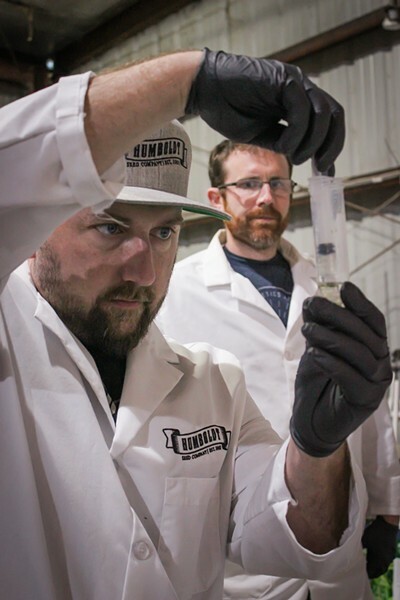 Skyler Palmer, head of cultivation at HendRx Farms, looks on as Humboldt Seed Co. founder Nat Pennington prepares a cannabis sample for testing. There's a glee evident in the air as the judges go about their task. 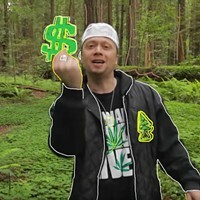 One comes across a Trainwreck plant and remarks about how all of Humboldt County smelled like this not long ago, back when it was the "it" strain everyone was growing. "That's so gassy," Poe remarks, after taking a deep sniff from another plant's bud, explaining it has that quintessential "diesel" smell. Hendricks, meanwhile, is sizing up a plant in the next row. His gloved hands gently pull a bud open and he inhales deeply through his nose. "Wow," he says. "That's just got the household cleaner smell. I just want to wash my clothes in it and walk around." After a couple hours of smell and eye tests, the trio huddle around a folding table set up in the garden area. 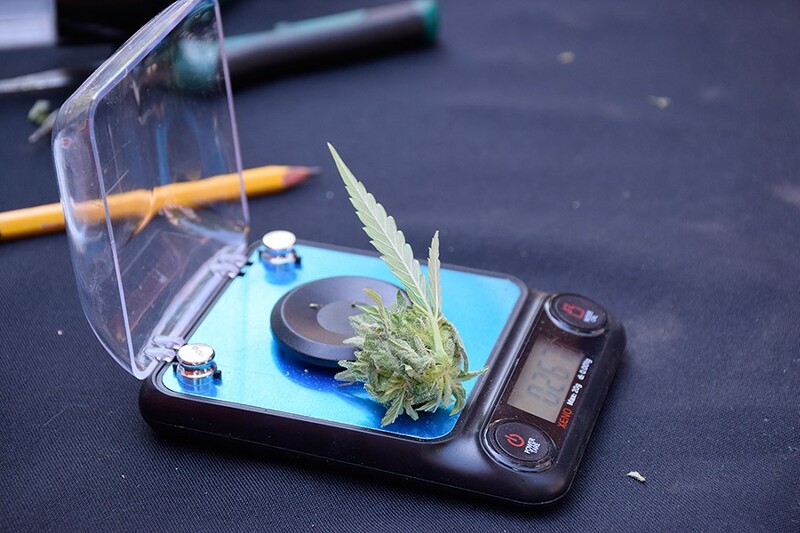 On it sits a portable liquid chromatograph that Pennington uses to conduct field potency tests that allow him, within about 15 minutes, to learn the THC and CBD content of a given bud. Each of the three men has brought back a couple of samples from the field, and Pennington sets about meticulously weighing them out, cutting them up and placing them in test tubes with a solvent solution that will then be fed into the machine. Pennington explains that the phenotype hunt is one leg of the stool — the one that allows cannabis experts to judge the plant based on its observables. The other legs are chemotype and genotype testing, which in turn allow them to see the exact chemical makeup of the plant (ie., just how much of the marketable measurables like THC and CBD content it has) and map its genetics through DNA sequencing. "When you combine all these things — the phenotype, the chemotype and the genotype — and you see something that comes out wonderful, that's called a dreamotype ... but that's pretty cheesy," Pennington says. 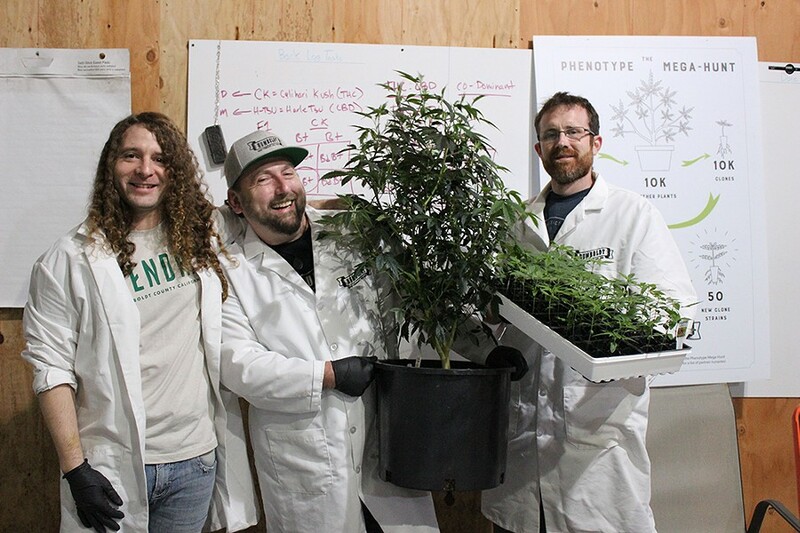 Left to right: HendRx Farms CEO Daniel Hendricks, Humboldt Seed Co. founder Nat Pennington and HendRx Farms Head of Cultivation Skyler Palmer pose with the Vanilla Frosting cannabis strain found in the phenotype mega hunt that sorted through 10,000 individual plants to find new strains. The unicorn hunt's roots stretch deep. Pennington, after all, has a background in fisheries conservation with Klamath Riverkeeper and the Salmon River Restoration Council and was involved in writing the grant that ultimately helped determine through DNA testing that the spring Chinook is a distinct species from its fall-run counterparts. But this incarnation of the hunt seems to have begun in earnest a handful of years ago when Pennington reached out to HendRx farms to make an unusual order. Typically, the nursery serves commercial customers whose orders take a certain uniformity. For example, they need 600 clones of OG Kush or Girl Scout Cookie that they aim to cultivate to bring to market as a single batch. But Pennington wanted something much different. "Nat called and wanted to order 10 of everything," Hendricks recalls with a laugh. The pair met in McKinleyville some time later and hit it off. Pennington, who's been breeding cannabis since 1999 and launched the Humboldt Seed Co. in 2001, had released a wildly popular strain — Blueberry Muffin — the year before. Pennington had crossed a potent purple strain with The Raz, a strain known for its raspberry flavor, back in 2008 and one of the pairings offspring had the unique phenotype of smelling almost exactly like a blueberry muffin. After coining the name, it took Pennington a couple of years of further breeding work to create the strain and a consistent seed stock that could guarantee someone buying a Blueberry Muffin seed could grow a plant with the desired characteristics. The strain blew up and is now planted worldwide. And Pennington had the foresight to license the strain, having found an old licensing agreement for Honeycrisp apples and modified it for cannabis, meaning he received — or was due — a small licensing fee for every clone sold from California dispensaries. When Pennington and Hendricks sat down, Pennington had another creation he was really excited about — Pineapple Upside Down Cake, a cross between Pineapple Trainwreck and Cookie Monster — that had been the result of another mini phenotype hunt. The trouble was that Pennington only had a single plant with the phenotype profile he wanted and it was struggling. 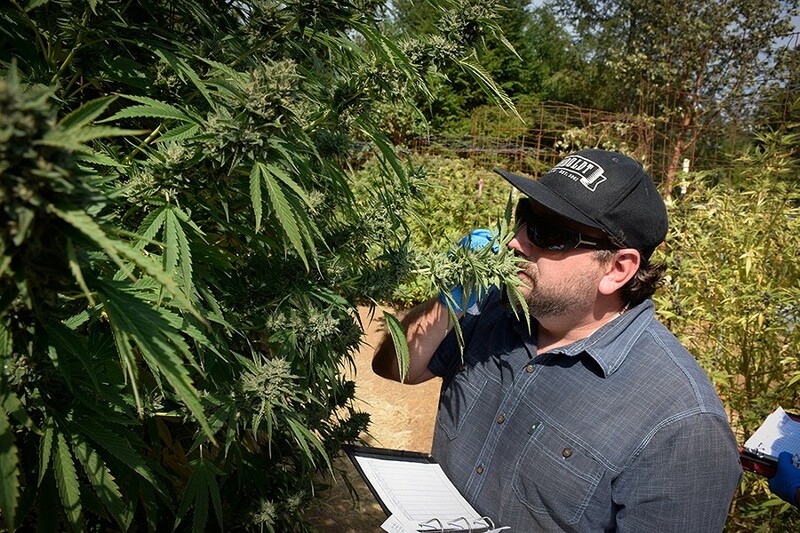 Humboldt Seed Co. founder Nat Pennington evaluating plants. He ended up handing the plant off to the folks at HendRx, who ultimately turned that one sickly plant into thousands of clones, which have now, in turn, spawned tens of thousands. "It was beautiful," Hendricks says. "We were sold out months in advance and watched as it traveled throughout the state and then back to Humboldt." 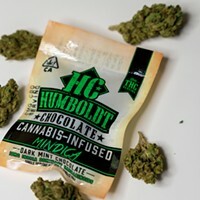 Through the success of Pineapple Upside Down Cake and a mutual love of genetics and breeding, a deep partnership was formed between Humboldt Seed Co. and HendRx, with both companies feeling an acute sense of urgency to seize Humboldt County's place amid the burgeoning recreational cannabis market in California. Pennington says he received advice some years ago that really stuck with him. "Don't assume that the holy grail of weed is already here and that you just need to stabilize it," he recalls. "Get out there, get creative and be an artist." The idea stuck and, through the success of his two small-scale phenotype hunts, and his collaborations with HendRx Farms and Dark Heart Nursery in the Bay Area, the vision for a massive, collaborative, large-scale hunt took hold. "I knew somebody was going to do this and that somebody was going to do it publicly, so it just had to be us," Pennington says. Hendricks agrees Humboldt County is the natural home for such an effort. "What happens here in the cannabis industry echoes out," he says. "We are the epicenter. We are the Silicon Valley of cannabis. We started businesses in our garages ... and we have the deepest population of cannabis genes on the planet. Nat had this vision and it was about seeing all of Humboldt collaborate on a project of historic significance." Ultimately, they brought in a host of partners, including Happy Dream Farms, Blessed Coast Farm, Humboldt County Indoors, Kind Peoples, Outliers Collective, South Ridge Farms and others, and everyone brought whatever unique cannabis genetics they had to the table, whether they be unique strain crosses or seeds long tucked away that had come to take on an almost mythic quality. But the partnership also demanded a lot of sacrifice, in both labor and space. First and foremost, participating farms were agreeing to give up a portion of their cultivation space to grow plants that would likely never make it to market. Due to state testing requirements and market forces, it isn't practical for a farm to grow 100 different unique plants with the aim of harvesting a saleable product, as each unique plant would have be tested in a different batch, an expensive process. Further, each of the farms was also agreeing to meticulously track the project plants' development, tying each to a unique tracking number, and to take cuttings of the plant to be grown in a vegetative state in a controlled nursery, ensuring that any "unicorns" found at the project's conclusion could be replicated through cloning. "At the end of the day, it's a tracking nightmare — it was a self-imposed, track and trace nightmare," Pennington says, adding that the project ultimately tracked not just 10,000 plants, but an equal library of clones as well. A bud sample sits waiting to be cut up and tested through a portable liquid chromatograph at the Humboldt Seed Co. farm near Orleans. It's shortly after 9 a.m. on a Monday in March and Hendricks has on a white laboratory coat that — coupled with his long, curly hair — gives him more than a hint of mad-scientist vibe. He's scrawling notes on a white board in HendRx Farms' warehouse, giving a reporter a mini course on plant breeding 101. It's stuff straight out of Intro Biology as he walks through how breeders work to eliminate or isolate certain plant attributes to, say, breed tulips of a certain color or cannabis of a certain potency. The 2018 phenotype mega hunt is over but its fruits are just hitting market. In an effort to make the hunt worth everyone's time, they've settled on a tiered roll out. First, HendRx will start offering clones — cuttings of a mother plant that are its exact genetic replica — to select local farms, giving both the nursery and the farms a kind of head start in getting what they hope will be popular strains to market. "They'll have exclusive early access to the latest and greatest before the rest of the state," Pennington says. In the background, Pennington will keep doing the much more intensive and prolonged breeding process that's needed to form a stable seed stock. They are pleased with the results of the hunt, saying it unearthed a number of unicorns, so many, in fact, that they're slow rolling their releases to market. First up are Vanilla Frosting, The Bling and Magic Melon. They also hint that The Grow Off — an annual competition prized by growers that sees farms given identical clones and then compete to grow them into the most potent plants — will feature some "unique genetics" from this year's hunt. Milling about in the HendRx Farms warehouse, Hendricks and Pennington also talk excitedly about what the future holds for cannabis as it is scientifically mainstreamed and treated like most agricultural products and less like something with seeds that need to be hidden away in sock drawers. Already, Hendricks says, they have DNA testing that can test seedlings for specific attributes — like a susceptibility to powdery mildew or drought resistance — and cull their stock accordingly. "It gives you the opportunity to learn things about your plant before you actually grow it," he says, adding that this allows breeders like Pennington to work at hyper speed, freed of the restraints of annual growing cycles. But what they are most excited about is the sense of collaboration in the air, the fact that a seed company and a clone nursery — direct competitors, in a sense — can work hand in hand, sharing information freely, in a quest for superior genetics. And the urgency of the moment isn't lost on them. They know that deep-pocketed companies and investors are plunging into the cannabis industry with the power to market specific strains and products, and to produce them on a massive scale. "There are outfits with actual marketing budgets, as opposed to calling a neighbor you know who can draw a little bit and saying, 'Hey, can you draw me a logo?'" Pennington says. "But we're all on the same team. People aren't at odds. They're trying to figure out ways to work together." Youtube.com/oliviajade. Illustration By Jonathan Webster.